In the past six months two new translations (Finnish and Italian) and a new set of policy statements (Finnish SKLs) have been added to RDA Toolkit, bringing the total of toolkit translations to five and policy statements documents to five. Of course this means more colorful icons popping up in the RDA display. And with the certainty that even more translations and policy statement documents on the way, some may find the the growing number of link icons a nuisance and a clutter and prefer that in-house staff focus on a particular translation or on a small selection of the policy statement sets. For such users, RDA Toolkit has added a new feature--the Master Profile. 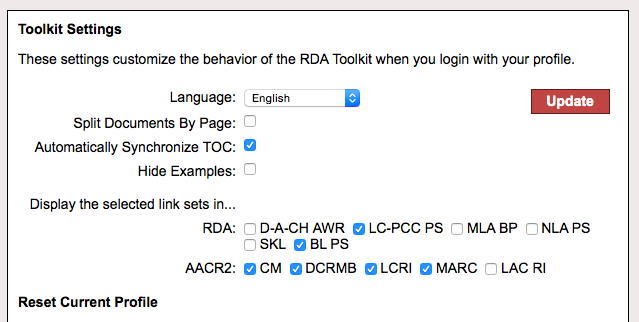 This special profile will allow staff managers to set RDA Toolkit preferences for any users of their account. The Master Profile uses the same interface as the personal profile page to allow the profile owner to set the language preference; choose whether to hide examples, split documents by page, or automatically synchronize the browse table of contents to your location in the RDA text; determine which sets of links will display in the RDA text. After logging into RDA Toolkit, click on the Create Profile icon . Complete the profile form using "Master" as both the Full Name and the Profile Name. Be sure to provide a password and email address and check the terms and conditions agreement. Click Create. Log into the Master Profile using "Master" as your profile name and your password. Make your selections and click the Update button. The preferences set in the Master profile will become the default settings for anyone logging into your account. Any users wishing to override the Master settings will need to log into their personal profiles. 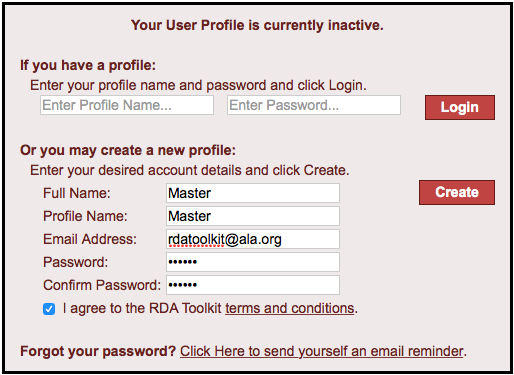 If you have any questions about this feature please contact us at rdatoolkit@ala.org.